San Diego, April 15, 2016 — Terrorism, turmoil and environmental damage pose critical threats to at-risk archaeological sites and artifacts in the Middle East, but a team of researchers based at the University of California San Diego is tapping the power of the ‘crowd’ to monitor damage to far-flung sites in the region. Screen shot shows distribution of 500 observations made in first week of TerraWatchers project with ASOR, which kicked off May 7. Some 700 sites were visited in first week by UC San Diego students. 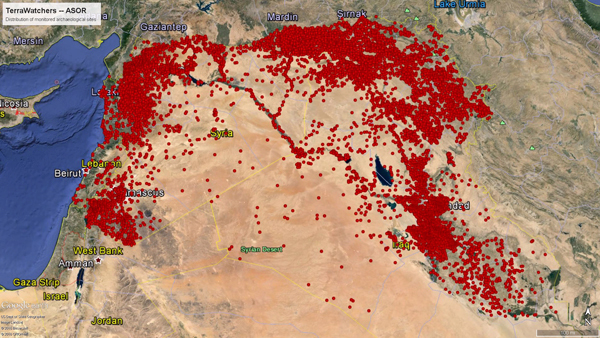 In a joint project with the American Schools of Oriental Research (ASOR) Cultural Heritage Initiatives, UC San Diego’s new Center for Cyber-Archaeology and Sustainability (CCAS) is working with the year-old crowdsourcing portal TerraWatchers to carry out a joint online mission to monitor nearly 11,000 archaeological sites located in Syria, Iraq and Lebanon. CCAS and TerraWatchers will recruit at least 100 students across four University of California campuses to analyze satellite imagery of the three countries. CCAS is a joint venture of the Qualcomm Institute and the Division of Social Sciences at UC San Diego. Google Earth image shows all the sites the TerraWatchers Collaborative will be monitoring. CCAS did not have to build a crowdsourcing solution from scratch because its senior Research Affiliate (and longtime Levy collaborator), archaeologist Stephen Savage, built an online crowdsourcing portal for satellite image analysis in early 2015. The pilot study focused on the impact of military activity and looting on archaeological sites in Lebanon, Syria and Iraq. With that finding, Levy and Savage recognized the importance of training, especially for citizen scientists. In the Spring quarter, the ASOR Cultural Heritage Initiatives-TerraWatchers Collaborative was extended to 20 students in Levy’s undergraduate class on “Archaeology, Anthropology and the Bible,” and five graduate students in his Levantine and Cyber-Archaeology Lab. He invited Savage to train the students in satellite imagery analysis during an April 7-8 visit to the UC San Diego campus. The 25 students are now registered TerraWatchers, and in the first 24 hours after the training session, the students had ‘visited’ 700 satellite images and made 500 observations (tagging points with apparent damage in or near the at-risk site). 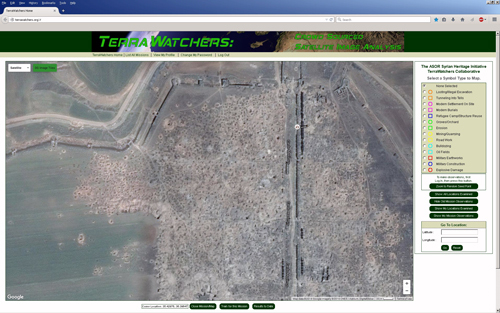 Screen shot of the TerraWatchers web application, with map zoomed in to the Classical period city of Apamea in Syria. Image shows extensive looting/pothunting holes inside the city walls. CCAS has set a target of at least 100 students registered on the TerraWatcher portal, primarily from UC San Diego and its three UC partner campuses in the ARCH project: UCLA, UC Berkeley and UC Merced. Savage and UC San Diego undergraduate intern Andrew Johnson, who is responsible for student crowdsourcing, will visit all three campuses to stage training workshops for students and staff working in the labs of co-principal investigators on Levy’s ARCH project: Willeke Wendrich (UCLA), Benjamin Porter (UC Berkeley), and Nicola Lercari (UC Merced). As it stands, the TerraWatchers portal makes two sets of satellite imagery available – those from Google Earth/ Maps, and from Digital Globe, through participation in the Qualcomm Institute’s Big Pixel Initiative, led by research scientists Albert Lin, Ran Goldblatt and Global Policy and Strategy professor Gordon Hanson. “The registered TerraWatcher can simply toggle between satellite images from the two basemaps, allowing them to compare and contrast apparent damage photographed on different days or at other times of day,” said Levy. “Users then have tools with which to mark suspect areas on the images for later review by experts.” For the UC project, students are encouraged to look specifically at areas within a kilometer of a known archaeological site (based on a list supplied by ASOR).